Relax in the hot tub, let the sun, the moon and the stars wink at you through the gentle undulations of the firs in the peace of Lothlorien Woods. Nestled at the foot of scenic, snow-capped Mt. Adams, Lothlorien Woods Hide-a-way is a charming, one-of-a-kind tree-house. Top Floor : The top floor, situated among towering evergreens, has multiple windows with stunning views. A hand-crafted, rustic, circular staircase featuring natural local woods provides access to the top floor. Click the photo to see more images of the top floor. 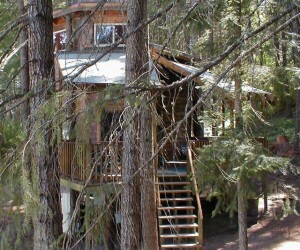 Bottom Floor : The main floor of the tree house provides all amenities necessary for a relaxing stay at the TreeHouse. The kitchen, complete with all standard appliances, utensils and dishes. is complemented by the propane barbecue on the front deck. The year-round hot tub on the deck adjacent to the living room augments your enjoyment of this serene setting. Outside : Lothlorien Woods TreeHouse Hide-a-Way is in a place of wild beauty. Enjoy leisurely walks or relax in the privacy of the hot tub located on the deck. Rain, snow or shine, the beauty and serenity surrounding Lothlorien Woods Hide-a-Way is unique and exhilarating. In summer the TreeHouse offers a "cool" alternative to the dust and heat of the city. In winter, the cozy warmth of the wood stove, the gently-falling snowflakes, and the quiescent snow-blanketed earth reclaim the peace and serenity of country living.